A couple of years ago, Dave and I got a cooking Moroccan recipe book from a friend as a Christmas gift. I have only ever seen the series in England. The recipes are not laid out in a manner that is brilliant, but the recipes are fantastic. Moroccans eat in a communal manner and this dish is served directly at the table in the tagine. 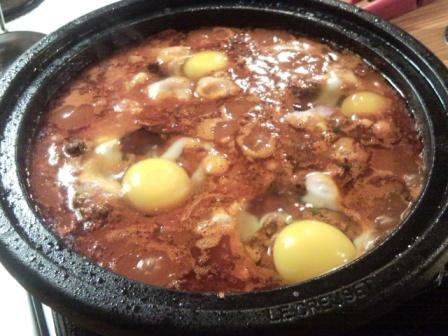 Here is my recipe for Kefta Tagine. Thanks for this, I received four tagines as a mothers day gift yesterday, so I am keen to read as many tagine recipes as you have to share.